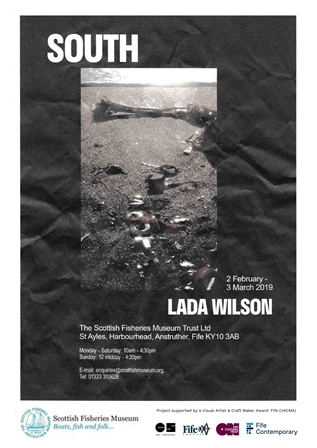 This exhibition is inspired by the Scottish Fisheries Museum, its rich history, its intriguing exhibition programme and, directly, the museum’s geographical position – on the shoreline, facing south. For Lada Wilson the concept ‘south’ itself and the many notions it conveys are as inspirational as the exhibits in the museum. South is often experienced as a faraway place – warm, different, somewhere we have to sail the seas to reach. Wilson spent more than half her life living in the south and, in her art practice, she typically uses words and languages, which led her to envision SOUTH as an acronym for: Sometimes Our Uttermost Thoughts Hover. This expansion of SOUTH closely reflects the precariousness of life endured by fishing families. But it could also have a more contemplative meaning: a yearning for sun and warmth that places in the south offer.